Send us an e-mail by clicking here. How many times have you thought about making a Maple Leaf block but decided against it because of the time consuming stem units? Or, opted to make the leaf block without a stem unit? Using the Leaf Stem ruler, multiple units can be constructed at once. Don’t be fooled by the name of the ruler as it has other design capabilities. Construct up to 1,100 different size combinations of blocks using the ruler. The blocks can be as small as 1 inch with a ¼ inch diagonal strip in the middle up to 12 ½ inch with a 2 ½ inch diagonal strip. Design “X” quilt blocks in a flash using this ruler. Once you have a few blocks finished, try slicing and dicing them for more great designs. This is an excellent ruler for the beginning quilter to the experienced quilter. 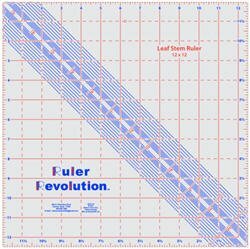 Click here for ruler instruction sheet.